The long sales cycle, complex client relationships, and high purchase price mean losing one customer could have a significant impact on sales and profits for many B2B companies. For many B2B companies, customer churn is one of the biggest challenges to increasing profits. Meanwhile, a large portion of churn can be attributed to a poor onboarding experience. Here's how you can improve your customer onboarding process to retain more customers. Remember, excitement drives growth! If you provide ongoing services or have a subscription-based model, getting a customer to sign on or make the initial purchase is just the beginning. You need to capitalize on the excitement of the sale and reinforce the purchase decision by showing the customers that they have made the right choice. Reiterate the benefits of the products or services the customer have purchased. Showcase the various features and functionalities of the product to generate excitement and anticipation. Share client testimonials, case studies, and success stories to demonstrate real-world results. Setting expectations with your customers can help avoid future misunderstanding that could erode trust, weaken the client relationship, and even lead to negative reviews or word-of-mouth. In your onboarding materials, communicate what customers can expect from your products and services. Outline what's included in the contract and what's not, how clients communications work (e.g., channels, turnaround time, points of contact), and other details in the fulfillment or delivery process. While most onboarding materials can be digitized and accessed via an online customer portal, sending a welcome gift or packet can help augment the customer experience and increase the chances that your clients will review the onboarding content. 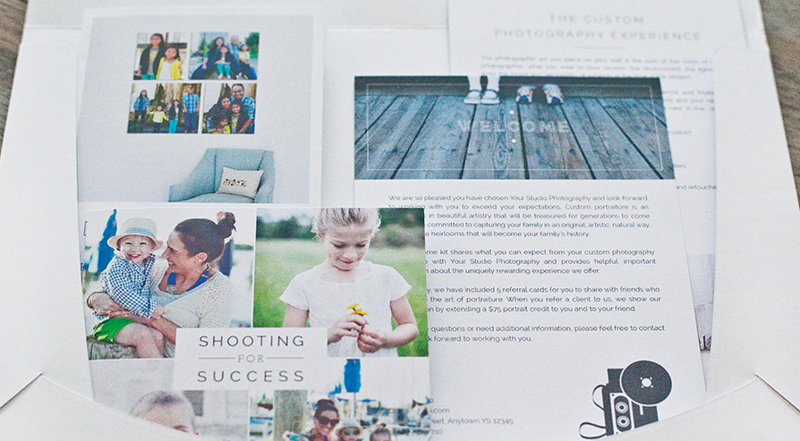 A welcome letter customized to the specific products or services the client has purchased. You can also mention requirements or circumstances specific to the client and reiterate what they can expect from working with you. Business cards of team members involved in the account and brochures about your services, which can help your client contacts introduce your company to their colleagues. Branded items, such as pens, mugs, etc. Educational materials on common problems when using your products or services. This can help set expectations while lowering customer service cost in the future. A USB drive that allows customers to easily access FAQs, user guides, instructions, demos, and other helpful resources. While the sales and marketing process often focuses on getting customers excited about the vision of the future delivered by your products or services, the actual engagement often requires some hand-holding or guidance so your clients can get the best results. In addition, it's likely that the salesperson will be transitioned off the relationship while an account or product manager will take on the client-facing role. A kick-off meeting can help facilitate such a transition and make your clients feel respected and taken care of. You can also use this opportunity to review how the customer relationship is managed to avoid miscommunication or frustration in the future. A well-designed customer onboarding process can help deliver an engaging experience and foster relationships that will increase customer satisfaction and client retention rate. Schedule a conversation to review your business goals and how they relate to your customer engagement strategy. Our team will reach out to ask a series of questions and provide suggestions on how your processes can be improved.